Written-off motorbikes are a horrible but familiar concept for most riders in the UK. Riders have seen one, owned one or feared one, but a familiarity with write-offs does not make the concept any easier to stomach. While the majority of riders will go a lifetime on the road without writing their own bike off, others won’t be so lucky. At the end of the day, as long as you get up and walk away from an accident, it doesn’t really matter what happens to your bike…but it does. Bikes are an emotive possession, ones that induce pride, passion and joy for riders so getting rid of one, or worse, being forced to get rid of one, is something that a lot of us will find difficult. And despite a familiarity with write-offs, it’s something not a lot of people know enough about. Is it the end of the road for your bike? Can it be salvaged? Can you insure it? Here we tell all. There are different categories of write-offs in the UK, which doesn’t make all that much sense because the term suggests there’s no way back for your bike. But that’s not always the case. Written off categories are rated in severity but not all will result in the destruction of your bike. A Category A write-off is the worst one. It basically means that your motorbike needs to be crushed and not one bit of it can be ripped out and sold. It’s a goner. Cat A motorbikes have usually been completely burned out, been ruined by flood damage or have severe and irreparable structural damage. Say bye bye to your bike. Category B write-offs aren’t great news for riders either and they cannot be resold. You can rip parts from a Cat B bike and resell them but the bike is beyond economical repair. Your motorbike must be destroyed if your insurer has written it off as a Cat A or B. Your insurer will take care of the destruction of your motorbike when you return it to them however you must inform the DVLA using your V5C registration certificate. A Category C write-off is one that is repairable however it would cost more than the value of the bike to do so. While most people may think that there is no point repairing a bike in this circumstance, many people do decide to fix their bike however insurers will not. If you decide to repair it then you must first return your V5C registration form to the DVLA. After the repairs are complete and you wish to tax your motorbike again, you can re-apply for registration. Despite your bike being repaired, evidence that it was once recorded as Category C by the DVLA will remain with it on DVLA records and other vehicle history check services. A Category D write-off applies to motorcycles with minimal damage, not usually structural, but an insurer will not repair it as the process may be problematic. For example, if an imported or rare model is labelled a Cat D then that may be because it would be too problematic to find replacement parts. Essentially it’s too much hassle for insurers. As the name suggests, a Category Theft is a motorcycle that has been reported stolen and remains unfound however the insurer has paid out on it. If it is eventually found an insurer is entitled to sell it. 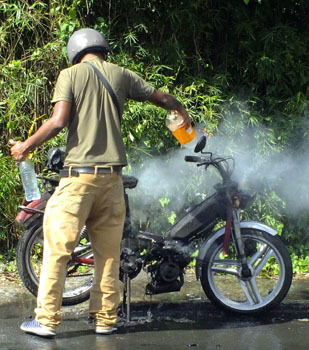 A Category F bike is one that has been minimally damaged by fire and should therefore be repairable. If a motorbike cannot be repaired then its write-off classification will be bumped up to a Cat A or B. On some private listings for motorbikes, you may see a mention of ‘not recorded’. This basically means that the motorbike has been involved in some form of accident or incident and has suffered some form of damage. However, rather than make a claim on the insurance, the owner has repaired the motorcycle themselves or chosen to sell it without repair. If you are looking at buying a motorbike that is listed as ‘not recorded’ then you need to be careful as there may be some damage to the bike that you cannot see. It’s a risk and one that is probably worth avoiding. Can I insure a written-off motorbike? Motorcycles that have been written-off can still be insured and they can make for pretty cheap bikes to buy. The biggest difference with a written-off bike compared to one that hasn’t been is the perceived actual value (PAV). That means the value of your motorbike is less than if it had not been written off, as you might expect. This has two implications on insurance. First, most insurers will cover repaired motorcycles but you will need to check with them beforehand. Usually they will ask for a fresh MOT for proof that the bike is road worthy. Second, the value of your motorbike will have gone down but the risk in insuring it has arguably gone up. This means your insurance premium could be more than if the model was brand new and had never been damaged. As is the case with any hunt for insurance, it’s difficult to predict what impact a previous write-off will have on it. Each case is unique, especially so when it comes to write-offs, so you should always compare prices with as many different insurers as possible.